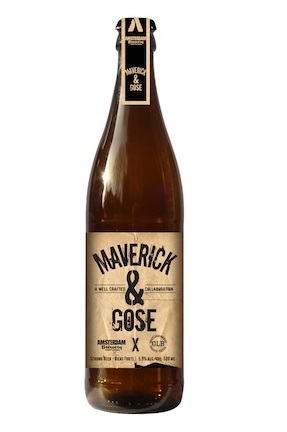 The Amsterdam Brewery and Great Lakes Brewery, two of Toronto’s oldest independently owned and operated craft breweries, are set to release their award winning collaboration beer – “Maverick & Gose” in the LCBO later this month. What is even more unique about this beer is that it is the first all-Ontario collaboration to be released in the LCBO. Brewers Iain Mcoustra of Amsterdam and Mike Lackey of Great Lakes developed the recipe for Maverick & Gose in early 2012. "We came up with the idea whilst playing shirtless, greased up beach volleyball, you know, like in the movie Top Gun, and we thought it would be fitting to collab on this one of a kind beer," says Lackey. "I'm super pumped to be part of the first Canadian craft beer collaboration that will grace the shelves at the LCBO. It was a pleasure creating this beer with Iain and the Amsterdam crew." Maverick & Gose is available for sale in 500mL bottles from select LCBOs starting the week of April 29, 2013 ($6.95) and the Amsterdam Brewery Retail Store (45 Esandar Dr., 416-504-6882).